The Gault Millau WeinGuide Deutschland 2018 was released on Monday, November 27, 2017, in Munich, jointly with the Gault Millau Deutschland 2018, which is food guide and rates restaurants and chefs. 3 days earlier, the Vinum WeinGuide Deutschland 2018 was released in Mainz. 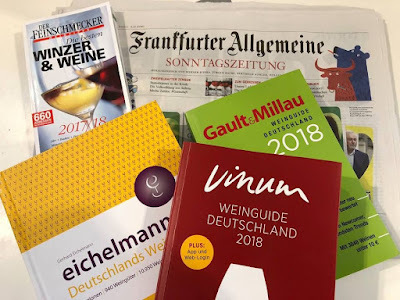 Interestingly, the Gault Millau WeinGuide Deutschland 2018 (24th issue) and the Vinum WeinGuide Deutschland 2018 (1st issue) share a common history. 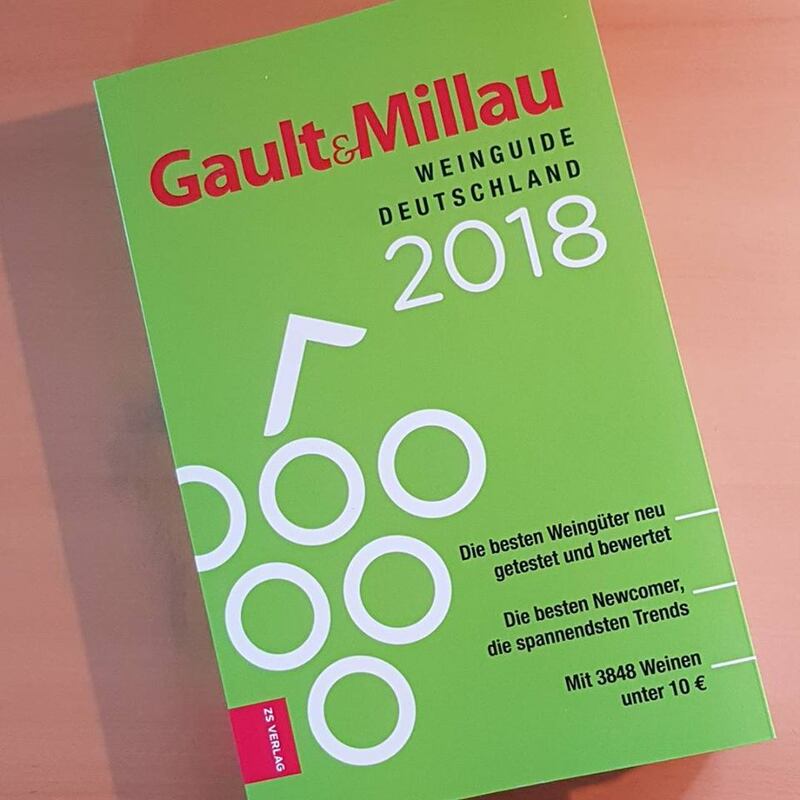 The Gault Millau WeinGuide Deutschland 2018 was published by the Zabert + Sandmann Verlag, which had aquired the license for the Gault Millau WeinGuide Deutschland from the Christian Verlag in June 2017, which had published the Gault Millau WeinGuide Deutschland 2017. A year ago, when the Gault Millau WeinGuide Deutschland 2017 was published by the Christian Verlag, Joel B. Payne was the Editor-in-Chief and Carsten S. Henn his Deputy. Joel B. Payne was at the helm of the Gault Millau WeinGuide Deutschland since its first issue in 1994 (earlier with Armin Diel). The Gault Millau WeinGuide Deutschland 2018 was put togather by a newly established team of tasters, all of them highly regarded, led by Editor-in-Chief Britta Wiegelmann, who took over from Joel B. Payne. Previously, she was Editor-in-Chief of the Vinum Wine Journal. As a result of all these changes, there was quite a bit of movement in the ratings between the 2017 and 2108 issues of the Gault Millau WeinGuide Deutschland. This becomes obvious, inter alia, when you look at the large number of climbers to the 5, 4 1/2 and 4 grapes categories. Notably the group of top winemakers with 5/ 5 grapes grew from 13 to 18 members. The Gault Millau WeinGuide Deutschland is a leading wine guide for German wine. Gault Millau WeinGuide Deutschland uses a scale of 1 to 5 grapes to rate winemakers and a scale of 1 to 100 points to rate their wines. The Gault Millau WeinGuide Deutschland 2018 contains the 1000 best German wine makers, of which 18 received 5/5 grapes. This is up by 5 grapes compared to last year. Nobody was demoted; 5 wine producers were promoted. One of the winemakers leading the German red wine revolution. Bernhard Huber, only 53 years old, died in June 2014, after a battle with cancer. His son, Julian Huber, has taken over. We visited Weingut Huber during the Germany-South Tour by ombiasy WineTours 2014 and again in 2015. 28 hectares. Weingut Dr. Heger shines with its Pinots (Noir, Gris, Blance) which account for 75% of the production. Joachim and Slivia Heger have been at the helm of this world class producers for about 30 years. 28 hectares. Joachim Heger also produces good wine under the Weinhaus Heger label, with grapes bought from other producers. Weingut Rudolf Fürst has the reputation of being a specialist for red wines, Spätburgunder and Früburgunder, which account for 60% of the production; but brilliant dry wines are also produced. Sebastian Fürst has taken over from his father Paul Fürst. 20 hectares. The older brother of Oliver Haag, Weingut Fritz Haag, grew up at Weingut Fritz Haag, see above. 12 hectares. Thomas Haag has been the winemaker at Weingut Schloss Lieser in Lieser since 1992 and its owner since 1997. Schloss Lieser – a mighty castle – is the landmark of Lieser, a tiny, quaint Mosel village, built in 1875 by Baron von Schorlemer. Weingut Schloss Lieser was founded in 1904 and produced some of the greatest wines in the Mosel region. In the second half of the 1900s, however, the estate passed through several hands and went into decline. Weingut Forstmeister Geltz-Zilliken is one of Germany’s leading producer of fruity-sweet and noble-sweet wines. The estate enjoys cult status in some circles, including with some of my wine friends in the Washington DC area. 11 hectares. Only Riesling. Within the last 30 years, Markus Molitor has turned Weingut Markus Molitor from one of hundreds of unknown family-owned wineries in the Mosel Region into a cult producer, when Robert Parker gave three of his Riesling Ausleses from the Ürziger Würzgarten, Wehlener Sonnenuhr and Zeltinger Sonnenuhr vineyard sites 100 points in 2015. Riesling represents more than 90 percent of Molitor's 65 hectares of vineyard, but he also makes a little Pinot Noir. Weingut JJ Prüm is one of Germany’s leading producer of fruity-sweet and noble-sweet wines. The estate enjoys cult status in some circles, including with some of my wine friends in the Washington DC area. 20 hectares. Only Riesling. Led by Dr. Manfred Prüm and his daughter Dr. Katharina Prüm. Weingut JJ Prüm was demoted to 4 grapes in the Gault Millau WeinGuide Deutschland 2017 (by Joel B. Payne and his team). Helmut Dönnhoff is a Grand Seigneur of German wine. After being at the helm of this prestigious producer, he handed over to his son a few years ago. Weingut Dönnhoff produces only Riesling wines. The dry ones are much appreciated in Germany, while in the US and Asia, Weingut Dönnhoff is better known for its fruity-sweet and noble-sweet Rieslings. 25 hectares. Tim Fröhlich took over the virtually unknown estate of his parents in 1998 and shaped it into one of the top Nahe estates in a very short period of time.Tim is a “master” of indigenous yeast fermentation. His dry wines are much appreciated in Germany, while in the US and Asia, Weingut Dönnhoff is better known for its fruity-sweet and noble-sweet Rieslings. 20 hectares. 85% Riesling. A broad wine portfolio with Riesling and Pinots (Blanc, Noir and Gris) as well as Chardonnay. All dry. A mover and shaker in the "Grosses Gewächs" movement. 19 hectares. The visit of Weingut Ökonomierat Rebholz was one of the highlights of the Germany-South Tour by ombiasy WineTours (2014, 2015, 2017). We will be back. Weingut Geheimer Rat Dr. von Bassermann-Jordan Ewas established in the 1700s by Andreas Jordan, who had immigrated to the Pfalz from the Savoy region. When he died in 1848, his bequest was split three ways – an event known as the Jordansche Teilung (Teilung means “division” or “sharing” in German) – giving rise to Deidesheim’s three biggest wineries, which thenceforth developed independently of each other and still exist today. Today, they bear the names Geheimer Rat Dr. von Bassermann-Jordan, Reichsrat von Buhl and von Winningen/ Dr. Deinhard. They are now all owned by the wife of the late Achim Niederberger. The estate produces a broad range of dry wines, with 85% stemming from Riesling grapes. The 2016 Forster Kirchenstück Riesling GG was rated at 100/ 100 points in the Gault Millau WeinGuide Deutschland 2018. One of the leaders of biodynamic winemaking in Germany. Last year's Gault Millau Deutschland Wunemaker of the Year. 20 hectares. 90% Riesling and 10% Pinot Noir. Peter Jakob's son Peter Bernhard Kühn is in the process of taking over. A top producer of Riesling wines, both dry and fruity sweet and noble sweet wines, well presented in the major wine markets in the world. Now co-owned by the Japanese Suntory company and General Manager Wilhelm Weil, the fourth generation of the founding family. 90 hectares. Only Riesling. Pictures: Kiedrich: Visit of the Basilica of Saint Valentine and of Weingut Robert Weil - Germany-North Wine Tour by ombiasy (2014). The roots of this Fellbach (near Stuttgart) estate stretch back to the 15th century. Gert Aldinger assumed the helm in 1992, with all the responsibility that comes with 500 years of winegrowing tradition. 15 years later, the estate was already counted among Württemberg's finest, with sons Hansjörg and Matthias beginning their chapter at the forefront. 30 hectares. 33% Riesling, 15% Lemberger, 15% Spätburgunder, 10% Sauvignon blanc, 8% Trollinger, 6% Merlot, 5% Weissburgunder, 5% Cabernet Sauvignon, 3% Chardonnay.